Blog posts, information and advice. 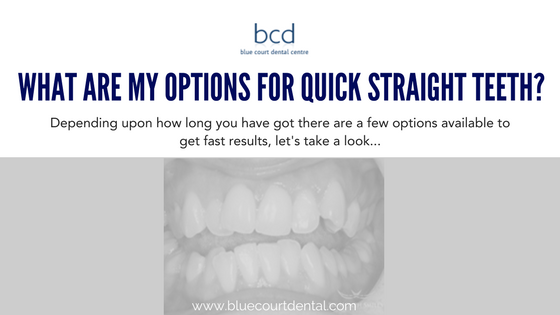 Blue Court Dental Centre is ideally located in Harrow close to London and West London, perfect for straightening and aligning crooked teeth with Invisalign. Do you have crooked teeth, and would like them straighter but do not want people to know you are having orthodontics? Or perhaps you had orthodontics when you were younger and your teeth have moved again, and being older you don’t want metal train track braces? There are now two new amazing treatments for almost invisible braces, available from Blue Court Dental Centre in the heart of Harrow. These are Clear Braces and Six Month Smiles. Invisible Braces with Clear Braces. This revolutionary modern orthodontic technique provides you with a series of clear orthodontic braces, which are almost invisible. Each Clear Brace moves your teeth a small amount towards your straighter smile. You simply where each almost invisible Brace for the prescribed time, normally a couple of weeks, then replace it with a new Brace. We will provide you with a series of clear aligners (braces)so there will be no need to keep returning to the practice each time. Invisible Braces with Six Month Smiles. This again is a modern technique and is an up to date version of the traditional train track braces. However this time the braces are made with clear brackets and tooth coloured barely visible wires. Opting for Six Month Smiles with fixed braces, means that tooth movement can be achieved more rapidly as we are able to put slightly more pressure onto each tooth. If you live in Harrow and are looking for a dentist to provide invisible braces for a straighter smile, then please do visit our website and download a voucher for a free assessment. This will include a full clinical consultation to discuss how you wish your new smile to look after you have had your invisible braces. Blue court dental centre is a Private dental practice offering high-quality treatments for the local people of Harrow. This entry was posted in Dentistry, Orthodontics and tagged clear braces, Invisalign, invisible braces, six month smiles on 26 August 2012 by Dr Nishan Dixit.